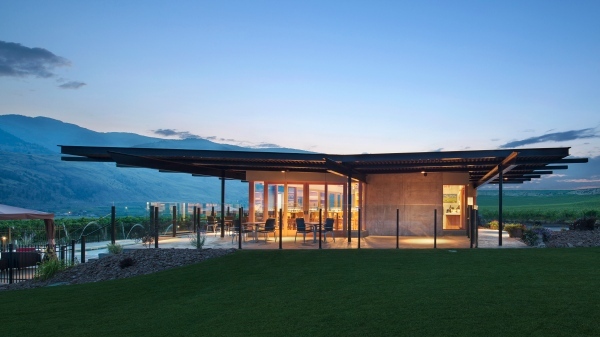 Black Hills Estate Winery on the Black Sage Road in the Okanagan is best known for their “Nota Bene” Bordeaux blend red wine. When I was taking my WSET classes downtown many years ago, it was extremely difficult to get a bottle of Nota Bene. It sold out very quickly upon release. One class mate lucky had purchased a bottle a few years earlier, and brought it to the class to share. The wine still to this day is highly regarded, and is made in limited production, at 3300 cases. The winery owners, since it started 20 years ago, with its inaugural 1999 vintage of Nota Bene has been committed to an ongoing practice of increasing the quality of the wine. This in part is done through building a temperature-controlled winery, improving the vineyard irrigation system into an environmentally friendly overhead & drip-line system, purchasing a sophisticated berry sorting line, and undertaking smaller batch fermentations in order to bring out the best possible aromas and flavours from the grapes. For the 2014 vintage, they changed their oak barrel aging, by giving the wine an additional 6 months in barrel, to further soften the tannins and integrate the flavours in the wine. I was recently offered a bottle of this newly released 2014 vintage of Nota Bene, with the extended barrel aging to taste. Let me tell you about my experience tasting this wine. 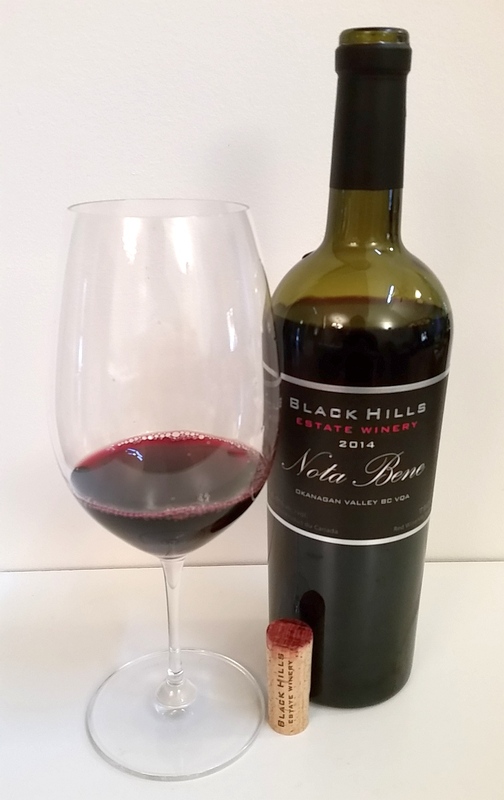 The blend for Nota Bene from past vintages to the present, has been Cabernet Sauvignon dominant, followed by Merlot, and completed with Cabernet Franc. The 2014 vintage is made with 52% Cabernet Sauvignon, 33% Merlot, and 15% Cabernet Franc. The barrels from past vintages are a mix of French and American oak, between new, first and second vintage fills. I do not have the information on barrels for the 2014 vintage, but I assume the same barrel regime would continue, except with the additional 6 months of aging. The wine is a deep garnet in colour. It has a medium plus intensity, youthful in aroma. With aromas of nice ripe red and black fruit, ripe plums, and complemented by vanilla and oak, and a hint of cedar. With decanting, cassis becomes more evident on the nose, as well as a hint of chocolate. The wine is dry, full-bodied, round and silky on the palate. It has medium plus acidity and tannins, which I think will allow this wine to age very nicely, for at least 5 years; the winery suggests that 10 years is quite feasible. The wine is fresh and fruity, with red fruit, a mix of ripe and tart black fruit, ripe raspberry and plum, cassis and black cherry. You get hints of cedar (from the Cab Franc), chocolate and leather. There is light vanilla and medium oak on the palate as well. Black currant leaf toward the finish. Medium plus length with mouth-watering acidity, pepperiness and some hotness on the finish. Ripe black fruit, black currant leaf and firm tannins as well. Decanting for 24 hours did not show much change in wine flavour, other than a hint of a floral perfume appearing. Rating: A solid, excellent quality red Bordeaux blend, that has lots of fruit flavours and aromas to enjoy. Age for 5-10 years for best appreciation. Where Can I Buy Nota Bene? I checked the Black Hills Estate Winery website, and they are sold through online ordering. You may want to phone the winery directly, or contact Everything Wine, as I see it on their website. Other private wine shops may also sell this icon wine from the Okanagan. Buy several bottles and enjoy them over time. ← So You Think You Know Rhone?